"Hello! I started updating my iPhone 7 to iOS 11.1 using iTunes and I met an error which says unknown error 17. How to fix this? Please tell me!" We will tell you some solutions that can be performed when you get stuck with iPhone restore error 17 or iPhone update error 17. There are many people who meet problems during the process of restoring iPhone or updating iPhone to iOS 11.1 and end up with errors like iTunes Error 17 or 3194. Mainly, the error comes because of connectivity problem. Let's move further without delaying much and understand what you can do to fix this unknown error 17 on iTunes. You may receive the iTunes Error 17 due to the outdated iTunes version. Therefore, it is suggested to check if you have the latest version of iTunes before jumping to any conclusions. Usually iTunes will prompt you if there is a new version released when you open iTunes, but in case you didn't notice that, please check it manually. If it is not the latest version, you need update it first and then try restoring your iPhone. See, if again the iTunes Error 17 comes or it has been removed. The security software or firewall may block the process and gives these kinds of iTunes errors. Check if any security software enabled or firewall is set since they may hinder the process and won't let iTunes to connect with Apple server. Disable or uninstall the security software to get the process done smoothly. See, if now you are getting the trouble or not. If again the restoring process gives error 17, jump to the next fix. As we said, iTunes error 17 mostly occurs due to connection issue. After checking above things, the next thing to make sure is checking the internet connection. Make sure the Wi-Fi you are using is stable. If the WiFi router is too hot, wait for a while and restart it. Sometimes, host files are the reason for iTunes error. The solution for this case is to reset the Hosts file on your computer in order to make sure your computer can contact Apple's server. For Windows computers, the steps are various for different Windows version. You can refer to this article "How to reset the Hosts file back to the default" on Microsoft official site. Go to "Finder" and choose "Applications" and then "Utilities". Open "Terminal" and type the command, "sudo nano /private/etc/hosts" and hit on "Return"
Subsequently, enter the same password you used to sign in to Mac and hit on "Return". Now, the terminal will present you hosts file. Then look for the "gs.apple.com" using the arrow keys. If there is no "gs.apple.com", then you can move on to the next solution. Add the # symbol and a space (like this "# ") to the beginning of the "gs.apple.com" and press Control-O to save it. Hit "Return" if you are asked for the file name. Then press Control-X. Now you can restart your Mac and try to restore or updating your iPhone again. You can use a third-party tool instead of iTunes in order to restore your iPhone and avoid iPhone restore error 17 or any other errors. 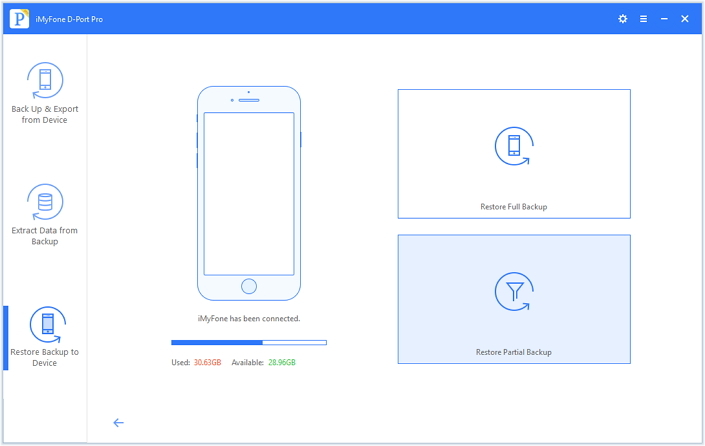 We will recommend you iMyFone D-Port Pro which is designed to backup and restore iOS devices fully and partially and can be counted as the best iTunes alternative. 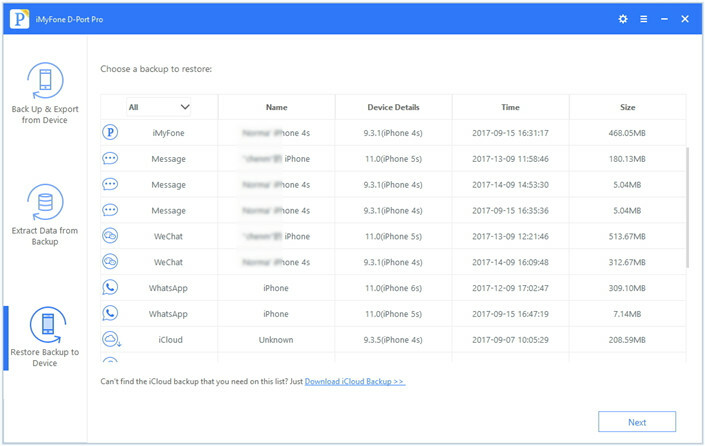 You can easily restore partial data like WhatsApp, messages or WeChat only from iTunes, iCloud backup, or you can fully restore your iPhone from the backup. We are listing the steps for selectively restoring iTunes backup below. Step 1 – Launch the program and choose "Restore Backup to Device" option given at the left panel. A list of backups will come on the screen for you to choose. Select an iTunes backup and click on "Next". Step 2 – Now select "Restore Partial Backup" and hit on "Next" button again. 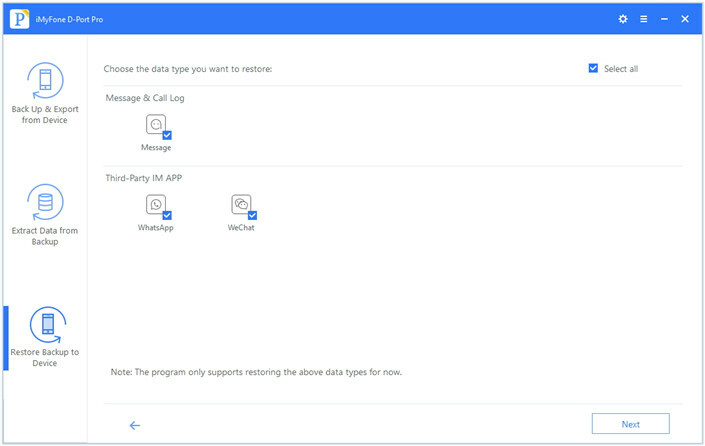 Step 3 – You will get the options of data types to choose from. Choose one you want to restore and click on "Next" to get the scanning begin. Step 4 – Preview the data you chose and once satisfied, click on "Restore". You are done! For updating iPhone, we would also suggest you a third-party tool which is iMyFone D-Back. It is an excellent data recovery program and and system recovery tool. 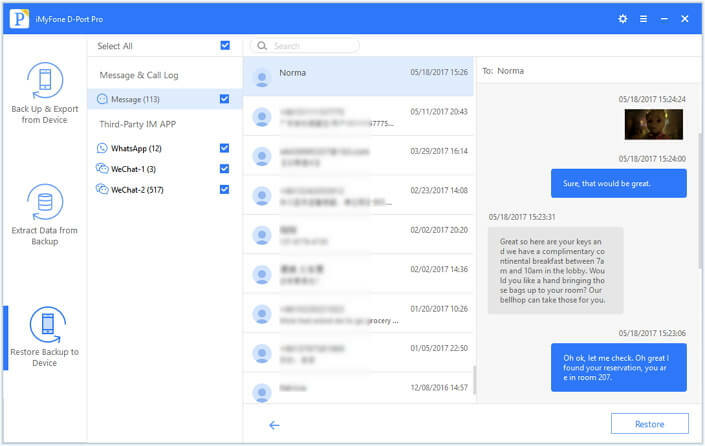 It has "Fix iOS System" feature that can solve various iOS issues. 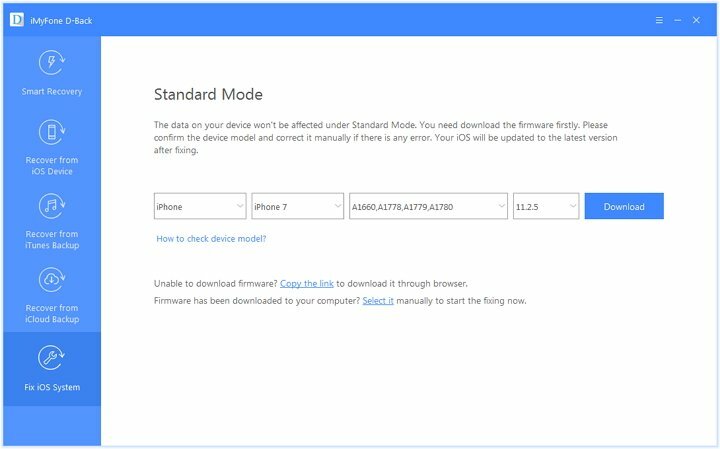 There are three different modes which are "Standard Mode", "Exit Recovery Mode" and "Advanced Mode". No data loss will be caused when using "Standard Mode". This tool will help you updating your device by letting you get you the suitable firmware for it without any error like iTunes error 17.
iMyFone D-Back is also an excellent tool that you can used to recover more than 20 types of deleted or lost data on your iOS devices, or extract data from your iTunes or iCloud backup. Download the program before you perform the steps. Step 1 – Open the program after downloading it. 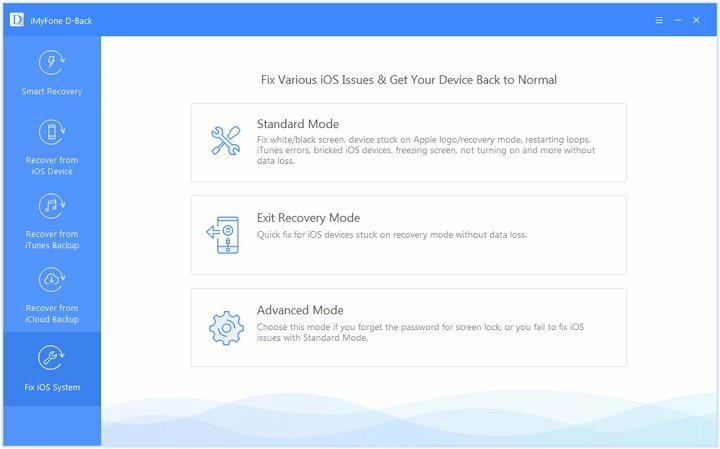 Select "Fix iOS System". Attach iPhone with PC via USB cable and select "Standard Mode". 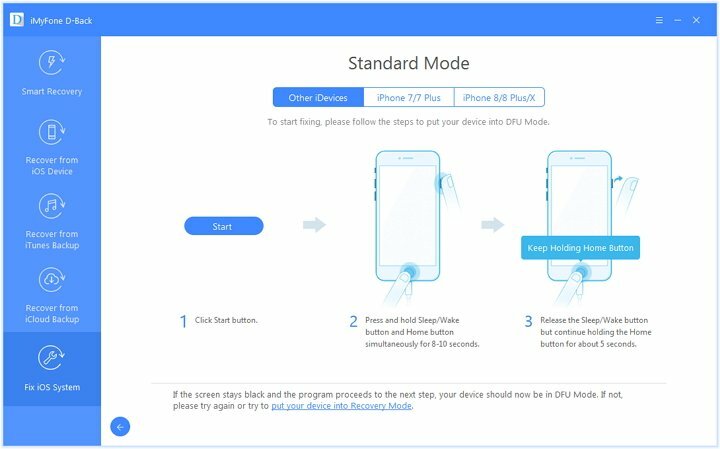 Step 2 – Now, click on "Start" and get the steps done to put your iPhone into the DFU mode. You can also choose to set your device into Recovery Mode if DFU Mode doesn't work. 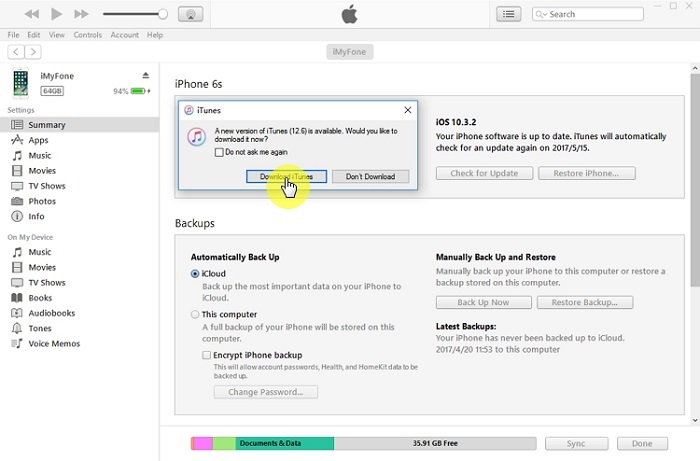 Step 3 – Your iPhone will be successfully detected by iMyFone D-Back and this detection will help in updating your device. Just press the "Download" button to trigger the program to get the matching firmware for the iPhone. Once you click, you will get the new firmware automatically. Step 4 – Click on "Start to Fix" and wait for the process completion. Once it finishes, your iPhone will restart. Those were some of the fixes that can be helpful as a solution for iPhone update error or iPhone restore error 17. Try one of these and get rid of iTunes Error 17 or any other error while updating or restoring your device. We hope you liked the article and get assisted by what we suggested you.